Navarro College Libraries | Pax – New York Best Seller! 07 Dec Pax – New York Best Seller! Pax was chosen as a New York Times Best Seller and the Amazon Book of the Year. 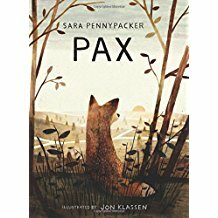 Pax is a heartwarming story about the adventures of Pax a young fox while waiting for his rescuer and friend Peter. The two become separated when Peter’s father enlists in the military and his father made Peter return Pax to the wild. Peter is sent to live with his grandfather and their adventures begin. Their discoveries lead to defining truths and costly facts of war. Pax will become a beloved classic for years to come.